Well, it’s been a while, much has transpired. Our nation feels like the gates are all closing, and the welcome mat is burned to ash. But I suspect that won’t last long, especially in the stretch of geologic time. We here finally got some gate work – and fence work – completed, and in a manner suitable for country living. So let’s take a look at the results, shall we? In our case, we have three – two person-gates, and one driveway gate. The driveway gate is a metal farm-style with some custom features and an added medallion from a Haitian artist – the photo is a bit sketchy but I will update later when I can get a better lighting situation. This was a somewhat problematic gate, as the installer made several errors, and when called to return to fix the problem, flaked off and never showed. I had to get a friend to help take it down and re-hang it, adding a wheel to the swinging edge. We are still trying to find someone to add an auto opener setup within our parameters – bluetooth detectors rather than channels in the asphalt, solar powered, etc. Local companies don’t seem interested in giving us what we want, they merely want to try and con you into the most expensive options. So we have to get companies from outside the immediate area who are more reasonable and professional. It is what it is. The people gates are basic redwood frame gates, one to enter a private garden (for my wife’s office) and the other allows the movement of our trash cans in and out, and access for the propane dude, among others. Since most folks drive in, this one doesn’t get much use – it is more a way to finish the fence and keep out the deer. The garden gate – as well as the other one – are not well designed – I left it to the fence builder, a big mistake. Due to their design, I cannot add automatic gate springs to close the gates. So I suspect I will have to re-build these two gates myself. But they at least have a decent appearance, so we will live with them for the short term. Be willing to pay more for the right design – don’t rely on the contractor to do your designs. They are builders – they will do what you say, and nothing else. And that includes advising you about limitations, etc. Their focus is completion and getting paid – period. Do it the right way – work out your design – on your own or with professional help – and don’t skimp. In a driveway gate, what is the slope condition? How wide is practical for the type of closure system? For the posts to manage the weight? For the direction of opening? Study all the angles – I guarantee there will be surprises, so do your best to anticipate and prepare. In a people gate – is the gate utilitarian, or also decorative? Are you seeking a uniform design, or will each gate – assuming more than one for the project – have different purposes that allow for varying designs and build techniques? Best to get such issues addressed before you start – it can make a big difference. In the end, are you happy with the outcome? If not, don’t fret – you just have to decide if you want to later modify, or re-do. In case you forgot – it’s your gate. Do what YOU want with it! There are days when you just don’t want to get up to answer the door, let alone the front gate. You just know it’s going to be some hawker of cheap goods, some religious pitch-person, some scammer after your hoarded gold, so why bother? Or maybe Aunt Hildy with her constant carping about how you owe your (fill in family member name here) better care/money/love/sympathy. And if the only form of defense is the gate and the door, well, keep the shades drawn and the TV off, and enjoy your scotch in peace, right? Of course, you COULD install a camera and a speaker by the gate. And think of the fun – you know who it is, you can let in folks you want to see, and exclude those you don’t while telling them you have rabies or some such repellent disorder they certainly wish to avoid. And watch the looks of disgust/disbelief/worry/anger cross their faces from a nice comfortable distance. You could even make yourself sound like a recording, which causes its own sort of confusion for the receiver. But there’s the cost, which really isn’t that bad these days, and the message that you are somehow more exclusive and important than the poor saps trying to gain your attention. Though you can always justify it based on those horrible home-invasion movies that make it seem as though we are all under siege all the time. It helps to remember why you put in that gate in the first place – to define the boundaries, to control who enters, to welcome but equivocate simultaneously. The castle gate is opened for friends, not foes, but must avoid turning one into the other. So consider the cameras and the speakers, but mount them as low-profile as possible. Consider making the area around the front gate as friendly as possible, using landscaping tricks to border the gate with greenery, vines and/or archways for framing (which also make mounting cameras easier, BTW). And if you plan on using a recording for those times when you are really not there, get your dog to bark in the background on the recording – dogs are the best security deterrent you can get. And even on a recording, it sends the right message to the unwelcome, while reminding the welcome that at least someone is home! What is being enclosed? What is being kept out? Or in? We begin with questions: how large, how long, how/where facing, electric or manual, material, design, lit or unlit, etc? Each needs to be addressed, but the first ones – what is allowed in/kept out – are the critical ones to begin with. Trying to keep in the dogs? Trying to keep out leaping deer? Persistent sales-folk? The entire world? Knowing your desired effect sets the stage for all that follows. Remember it is a boundary, as well as a portal. It sends a message, and it can make or unmake neighborliness. So think on this carefully – it’s an expensive do-over. We have decided the main thing is keeping in the dogs. This means gate and fence height is OK at 5 feet, six max. Here in the Coastal Zone, we are not allowed to exceed 6, and the top 2 feet must have some visibility – lattice work or slats, that sort of thing. And the gate, like the fence, must come within inches of the ground – dogs do like to wiggle under things, right? Additionally, we have a max length of the gate at 14 feet, and we want an electric opening gate, as it is about 150 feet from the house. And we will be adding a man-gate adjacent, so the trash cans are easy to get in and out, and the propane delivery can be done when we aren’t home. Oh, and so the fire department can, well, you know. These then become our minimums and maximums, and within those confines our actual design conditions can proceed. The next decision, then, becomes material. Why? Because we have specific requirements that will impact the practicality of those limits – a metal gate weighs less than an equivalent-sized wood gate, and impacts the choice of opening and hanging hardware. It also has a bearing on the vertical supports, both their material and their bulk/design. If you select wood, you need more substantial side supports – you may even need a slotted guide and wheel mechanism. A metal gate allows a few more options. On the other hand, a nicely-designed metal gate can cost more – not in every case, but it might limit your design choices to something simpler than your initial imagination conjured up and set you on this quest to begin with. Additionally, deciding between metal and wood greatly influences the actual design. Metal can be formed with far greater shape choices than wood – it bends, it can be welded, it can be very artful. A wood gate, on the other hand can say more about you than the more limited physical designs might suggest. Remember back in August of 2012? Sure you do! Remember https://atthefrontgate.wordpress.com/2012/08/18/a-visit-to-the-neighbors/ where we spoke about our neighbors? It’s OK, I’ll wait – go refresh your memory, and then we’ll pick back up, alright? Good, now we can proceed! Wood has weight, has history, it has been used for gates and fences for millenniums. It can be in-your-face monoliths, or cheerful welcomes to every passer-by. Art is still possible, though perhaps a bit more limited, but still vital and affordable. Arriving at your choice, as you might begin to see, can be daunting. Unless price is your only consideration, of course – there are some very affordable wire-fence and wire gate options, but I won’t be addressing those here – my blog, my bias! Break it down: Cost will make itself clear – you may have a fixed budget, or you may prefer to go for your dream. Either way, you can start with cost, or just wait and see where it’s going to land. Then you can begin the inevitable back-pedal, reducing the demands of your ideal end-product on your bank account. I find it helps to go that way, but it is just my personal preference – everyone has their own comfort zone with this stuff. Remember that the size and weight of the fence governs the hardware, not the other way around: you don’t decide on size and weight based on that fancy hardware you want no matter what. You have to make the primary material decision, and analyze the amount and content of that material based on both size and design: buying 100 board feet of 2 x 4s is foolish if the majority of the gate will be planking – unless you are building a really long and heavy gate, that is. In our case, we are going with the maximum 14 foot width. And because the surrounding fence will be 5 feet, we will keep the gate at 5 feet, though with some “moments” in the design that project above that height a bit. And the driveway will be crushed granite, so the gate has to ride a few inches above that – not a practical location for a ground channel. This, then suggests the driveway gate should be metal (for lower weight), and this in turn suggests we go with decorative vertical support pillars that will complement the gate, but tie into the wooden fence These, then, are the rough design limits the actual form of the gate must remain within. Next time, I will be ready to show the design process as it unfolds. I hope you come back then! We think of gates and fences and walls as a means to separate outside from inside, my stuff from everyone elses. We posit privacy based on quite ancient concepts without stopping to consider the actualities. Can we keep out thieves and murderers? That depends on how high and how dangerous our walls, fences, and gates are designed, one could say. But then we still have to emerge on occasion, and that greater world remains problematic when we choose to live in fear, especially of those we consider “the other”. And when we remain inside our fortresses, we still occasionally have to allow “the other” inside – repair people, maintenance people, perhaps even those few friends we still manage to trust – even if just so far. This is not to say fences, walls and gates have no purpose, but that we need to find a balance between a fortress and the realization we all live on one round planet, and need to find ways to get along, perhaps even to build better communities. This is the difference between modern guarded estates and communities and older-style towns and villages where gates were as much about welcome as they were about “hey, this is my property, so knock first, OK?” The real security came from people making agreeable rules for getting along. Sure, there will always be some who refuse to respect those rules, but the trade-off allows better community life for the greatest number of people over the longer period of time. Gated communities, in my experience, have very little to show as “community” as opposed to security, and thus, isolation. You always have to wonder: on a spherical planet, how does one actually determine “outside” from “inside”? About fifteen years ago, I designed and had built my first gate – you can see it in the blog’s header photo. Made largely of Honduran mahogany, salvage, actually, and not a single idea of what I was doing. My contractor was very skilled, and we worked together to make it a reality. It served as a focal point for us for many years, and we had many visitors and neighbors who would be happy to spend twenty minutes, or even an hour, just chatting over the gate. That was what actually instigated this blog, more than any other factor. Now, we have moved to the country, and have some real acreage, and our dogs need room to run, without succumbing to the natural desire to chase deer and raccoons. So the project is different this time because we don’t live where there are a lot of pedestrians now, which makes the entire notion of a fence considerably different that with our first, so urban in nature. Now, this is more about dog-containment and privacy. But to do those things without considering the esthetics – as many do hereabouts – just seems like a waste of effort to us. So, here we go again! Due to local codes, our front (road-facing) portion cannot exceed 6 feet, and the top 2 1/2 feet must have some sort of open aspect, such as lattice work or slats, which immediately sets limits for design, as well. But I am working on several ideas, and hope to have them ready to share here in the near future. 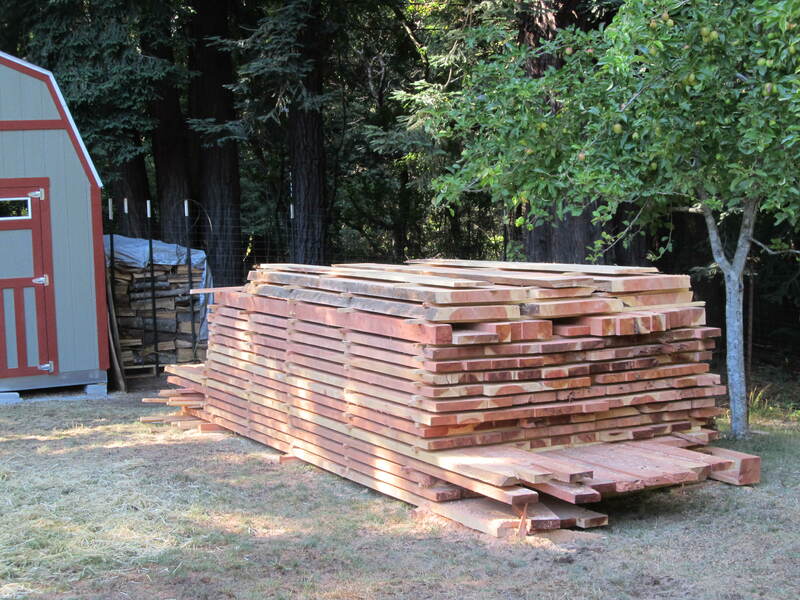 I know they will be mostly redwood – as I have a lot available! And the driveway fence will be metal, because weight, mostly, is less that way, and the auto opener works better with the least amount of weight. So taking those two limits as starting points should make this quite interesting. Stay tuned, and as always, I would love your feedback, and for you to share this blog with your friends! And help me name our new deer herd!